We’ve talked about Julia Turshen before. This avocado-cucumber salad remains my favorite thing I’ve spied on the side of a plate on Instagram, ever; these merguez patties are still a weeknight favorite. I’ve always loved the way she assembles meals for friends and family. She so naturally answers the forever question, but what should I serve with it?, that when I learned her new book was built around collections of recipe that both work together but also new recipes to make with their leftovers, I couldn’t wait to dig in. The menus are fun and delightfully unpredictable — Red-Checked Tablecloth Late Saturday Lunch but also a No-Stress Thanksgiving — but my favorite, the one I’d like to believe was written just for me, the girl who loved going to steakhouses when she was a vegetarian because the sides are so good, is the Steak House Dinner for Vegetarians. Maple syrup old fashioned! Wedge salad! Stuffed mushrooms! Charred broccoli! Baked potatoes with horseradish and cheddar! And as a finale: this cake. Let’s be absolutely clear: this is not a traditional black forest cake. 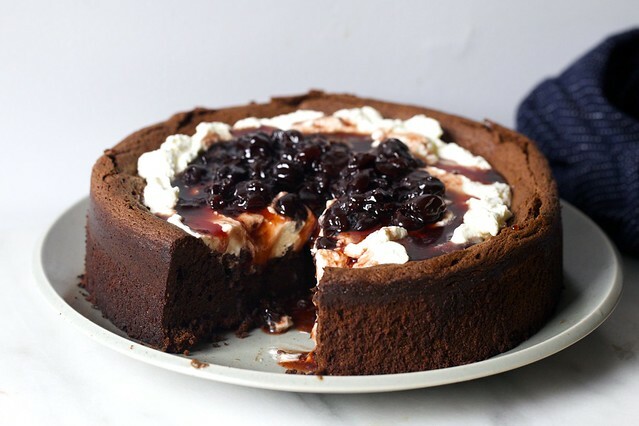 A black forest cake (the German Schwarzwälder Kirschtorte), is a chocolate layer cake sandwiched with whipped cream and boozy cherries, finished with shaved chocolate and more cherries. It’s fancy. It’s complex. We’ll make one… one day. But this is for today, with everything good about the layer cake, abbreviated: a fudgy-centered, puffy-edged flourless chocolate cake that sinks in the center after it bakes. This space perfectly allows for a raft of barely sweetened whipped cream. And then, instead of imagining for a moment that anyone wishes to chase down sour cherries in October, she recommends using storebought cherry preserves and adding kirsh. I found several online; this was my favorite (it reminded me of Luxardo cocktail cherries) but there are plenty of other great ones out there. Honestly, the cake doesn’t “need” it — it works without the cherry sauce — but it’s so good, I do. Grownups need candy too. 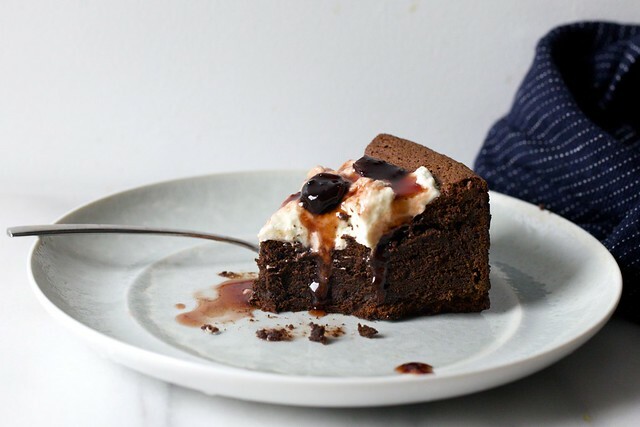 This recipe is adapted from the flourless chocolate cake in the Buvette cookbook, a project Turshen worked on. However, in the Buvette, the recipe has more butter and sugar; in Turshen’s book, it has less. When I tested it, my happy place was in the middle — too little sugar and the cake was dry, too much and the sweetness of the preserves overwhelm — and that’s what I’ve shared below. The kirsh in the cherries both loosens them and gives them a little kick. If you don’t have it, try light rum. If you don’t use either, try a tablespoon each of lemon juice and water. Make the cake: Heat butter and chocolate together until about 75% melted in the microwave or over the lowest heat in a saucepan. 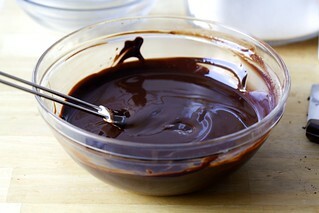 Remove from heat and stir until it’s finished melting and is smooth. Let it cool while you prepare the rest of the cake. Heat your oven to 350°F (175°C). Coat the bottom and sides of a 9-inch round cake pan with nonstick cooking spray and line the bottom with a circle of parchment paper. Set it aside. Place egg whites in the bowl a stand mixer fitted with a whisk attachment, in a large bowl and use a handheld electric mixer, or use a large whisk and a lot of elbow grease. Beat on medium-high speed until they’re foamy, then slowly pour in the lemon juice and half the sugar, continuing to beat until the egg whites are billowy and almost glossy and hold a soft peak. This is important: try not to overbeat them until they’re stiff and tight foam-looking; it leads to more dry cakes. Set the egg whites aside (if you only have one stand mixer bowl, scrape them into a separate bowl so you can use it again). 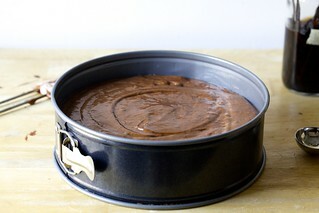 Transfer batter to prepared cake pan and smooth the surface. Bake until the center is puffed up, and just barely firm/dry to the touch, and a toothpick inserted into the center comes out with just a few dry crumbs clinging to it, about 35 to 40 minutes. Try not to overbake it (the chocolate at the edges will smell toasty) or that cake can taste dry at the edges. Place the cake on a wire rack to cool completely; it will sink in the center. To finish: Once cake is completely cool, beat the cream, sugar, and vanilla together until medium peaks form (I overbeat mine, whoops). In a small bowl, combine combine the preserves and kirsh. Use a knife to loose then edges of the cake from the pan and invert it onto your rack. Peel off parchment paper, then invert it back onto a serving plate. Spoon the whipped cream into the center and then the preserves mixture on top. Cut into wedges and serve. Do ahead: Leftovers keep covered in the fridge for 3 days, however, if the cherry-cream appearance doesn’t look great after a couple hours, although this has no effect on taste. To avoid this, you can just put the cherries on as you’re serving the cake in slices. I adore Julia Turshen – I’ve had great success with both of her books (Small Victories is a perennial favorite). In fact, I’d argue that both of you provide recipes that are foolproof and created with the idea of nurturing one’s self and loved ones. I wonder how this recipe compares to Richard Sax’s flourless cloud cake? This looks great! And steakhouse vegetarian is one of our favorite meals. Quick question: the images have a springform pan, the recipe calls for a cake pan – does it matter? Julia Turshen calls for a regular cake pan. I used a springform because I cannot read recipes. :) Either will work. If you have a springform, might as well use it. Just made this in my “regular” short cake pan (maybe 1.5 inches high?). In fairness, it was an 8 inch pan as well, so I reduced things by 1/6 (i.e., 10 tbsp butter and 5 eggs). But, I made a collar to go around the pan out of parchment paper, which was a good idea, since the cake did rise a little above the natural edge of the pan and would’ve made a royal mess. So, perhaps the answer is that it’s absolutely do-able in a “regular” pan, but be careful. Love this! Just realized it was flourless, which means I have at least one amazing cake to keep me sane during Pesach. I made it in a regular pan and it was a mess. By the time I was done loosening the edges and inverting it the entire crusty top was in shards all over the counter. I threw it away. Definitely use a springform. I love flourless chocolate cakes! They’re great for gluten-free guests. Funny, someone else mentioned the Richard Sax cake, which seems a similar style. I got the Food52 Genius Desserts book after I made this, which is when I noticed it for the first time. I thought about making it and comparing, but I wasn’t unhappy with this cake (once I tweaked it) so I let it be. But I do think I might have to try it next and report back. For research and stuff. Nigella has a similar cake in Feast: the Chocolate Nest Cake, I think it’s called, which she fills with chocolate whipped cream and baby chocolate eggs and serves for Easter. An annual Easter tradition for our family! 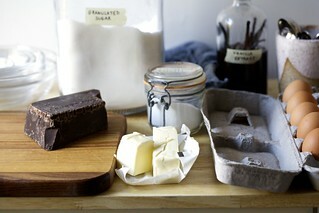 My favorite flourless chocolate cake recipe. I’ll have to try this for the research as well! Thank you for a gluten-free chocolate cake! I have loved your red wine chocolate cake for years, and used to be a huge baker, but I can’t eat gluten or rice any more, which rules out a lot of deliciousness. I’m back in the saddle now! Thanks again! In the interest of ensuring that as much red wine chocolate cake is eaten as possible, let me assure you, it bakes up *wonderfully* with gluten free flour! In fact, I’ve only ever made it that way (been gluten free for about 10 years). Better Batter, Cup4Cup, and Namaste all purpose blends all work wonderfully! Oh no, I just saw your rice comment! Have you tried the Ancient Grains flour blend (which is also rice free)? I do think the cake is forgiving for alternative flours since it’s naturally dense and fudgy! I haven’t tried it, but I will definitely give it a shot! Thanks for the tip! If I was going to make this ahead (say, on Friday to serve on Saturday), could I make the cake ahead and keep it at room temp, then top with whipped cream and cherries before serving? Or should I keep the cake in the fridge even if it isn’t topped? I don’t think you need to keep it in the fridge if not topped, and agree it’s nicest to add the whipped cream and cherries before serving, or at least the cherries. With a simple substitute for the sugar, this cake could easily be made keto/low carb friendly! I’m ridiculously excited! What sort of sugar substitute would you use here, just out of curiosity? Nigella Lawson’s Easter Egg Cake (and fallen chocolate cake) is also a riff on the Richard Sax Recipe. It’s my Husband’s favorite cake. Try them all in the interest of science. Even more than the delicious-sounding food, I get chuckle-y and happy just reading your wonderful wiriting, Deb. So Deb, my boyfriend doesn’t eat chocolate, can I substitute canned salmon? And can this be made in an Instapot? And what if I’m allergic to dairy/cherries/butter? Can I make this in a muffin tin? My secret is, not that anyone asked: Comments/questions don’t bother me at all. They are literally the only thing in the world I am zen about it. Too bad I can’t bottle it when I stub my toe or… have to go somewhere without having coffee first. Laughed out loud! Thanks for brightening my Monday morning!!! This craving for chocolate sounds like … At least in my experience. Hi Deb, this looks really yummy – I’m bookmarking for Passover! But I never bake fresh desserts for Passover (too much food cooking to do!) so I always bake the week before and freeze. Do you think this cake would freeze well? And would you freeze it without the topping and then add the cream once the cake is defrosted? (I’m going to skip the cherries, they’re not my thing.) Thanks! Have done a similar cake for Passover and it froze quite well. Than only the “whipped cream” and cherries have to be added at the last minute. Springform as pictured or cake pan as described? I used a springform because I am bad at reading recipes. :) If you have one, no reason not to use it here. I have some homemade Luxardo cherries, can I top it with those? It might work. Not sure how thick/thin/or boozy they are so you might need to adjust accordingly. Allow me to sycophant about the place today: there are days when your posts convince me that we must be twins, secretly separated at birth (except, you know, I’m from the opposite end of the country and a decade older, so there’s that…) I love everything about Black Forest cake generally (so boozy, so 70s, and cherries!) except the making of it (layers, and piping, and general tediousness!) This is so going on my list of Christmas bakes. Thanks for all the recipe testing you do for us. I hate to be that person, but we don’t really like cherries (well fresh, yes, not in desserts). Would strawberry preserves work and would I use kirsh or light rum? Thanks! I don’t see why you couldn’t use another type of preserves you prefer. Personally, I’d think kirsh would go better with a berry preserve but mentioned the light rum as an alternative because Julia Turshen did. Just two weeks ago I was looking for the perfect Black Forest Cherry Cake recipe to make for an International Night for one of my kids. I improvised, because I didn’t have time to do a full on recipe. But I used too much whipped cream and the top layer slid off in transit. Not that any of the Boy Scouts cared. But ever since, I’ve wanted to make it again. Well. And adult friendly. This looks divine. I now need an excuse for cake!! my go to excuse when I “need” one is that Every Day is My Birthday. highly recommend that approach…apply as necessary. Do you think that I could substitute your tiny but intense chocolate cake from your first cookbook for the cake portion? I just need a smaller version of this black forest cake. Yes — in fact, I think the cake is very similar (but with brown butter). Not as sweet as Luxardo but it was a sweet kind of loose jam. The alcohol cuts the sweetness, as does having a barely sweetened cream underneath and a not-excessively-sweet cake. I can’t wait to make this. I much prefer the idea of layering the cherries instead of incorporating them in layers. The ‘real’ Black Forest Cake always looks overwhelming — not the making of it, the eating of it! I noticed you used a dark springform. I’ve had ‘cooking too fast’ trouble with dark pans. I did a bit of research and found that that problem is commonplace, so I gave them away. Have you ever had that problem? One note–I so enjoy your writing, but was stopped a few times when reading this recipe. It needs a bit of editing, all the way to the end. I’m so excited for this recipe!! I love black forest cake but have been too lazy to attempt it at home. Trader Joe’s carries both preserved Amarena and Morello Cherries (both are in syrup). I’ve often seen them and wanted to use them in a recipe. This seems like a great chance!! Should I cook them down a bit? Which type of cherry would work better? Leave it to Deb to post a dessert (I’m a lousy baker) featuring cherries, (which I despise) yet still manages to inspire me to attempt this cake asap. In Deb we trust…. I made this tonight and it was delicious! The whole family loved it! This cake is delicious! My pan was a square springform pan. I used what I had. It was slightly larger so I cooked it less time than instructed and probably a minute too long. It is important not to overcook. Also, this cake gets better second day. It is amazing once it is cold. Could not find cherry preserves so I used a 4 berry blend. There was no kirsh, so I used light rum. Thank you, Smitten Kitchen! Another hit!!! I made this from Turshen’s book before you posted your version. My cake pan was a 9″ round with 2-1/2″ sides, sprayed with Baker’s Joy, parchmented, and sprayed again (as per Julia’s instructions). The cake rose almost 1/4″ above the pan but sank considerably when cooled. I had no spillage. I also used Bon Maman 4 Fruit Preserves, adding 2 tbsp of Chambord and a handful of crushed raspberries. The finished cake is not sweet at all and is almost too dry and crumbly. However, when you add the cream and the fruit, it is the right amount of everything. I’m eager to try your take. I can get behind chambord on any dessert! No, it’s actually the cherry sauce on top of the cream that looks terrible after a while, gives it a slightly broken/curdled look. I made this cake last night, and it was beautiful and delicious. Will definitely make it again. One comment: I had trouble getting the cake out of the regular cake pan, despite having sprayed it and using a parchment paper circle. So next time I will use a springform pan. Thanks, Deb. Okay, this is a non-sequitur, but I just saw your second op-ed in the NYTimes. Does this mean you’ll have more future pieces? I enjoyed reading it and I agree. As much as I like a school bake sale, sometimes it feels like a holdover from another era when households were 1 income and all women were only expected to do work inside the home. Anyway, it was a good read which I encourage others to check out. You definitely got a range of comments. It was nice to break from the regular news articles. Congrats! Thanks for the recommendation of Deb’s op ed! I loved it too–maybe there’s a non-cook book in your future! P.s. My trick for kids’ bakesales? A giant cookie mix from Sam’s Club/Costco. 5 dozen cookies in an hour–the kid loves you, the school loves you. Done. Thank you. There could be future pieces, I suppose! I pitched three ideas when they reached out to me and this is the second of them; not sure I feel strongly enough about the third right now. Good flavor and texture, recipe was too sweet for me as written. Would try again with 1/2 cup sugar instead. Also, it rose *a lot* so I would definitely recommend a spring form or other tall sided pan. I made this in a springform and reduced the sugar to half a cup. It was easy to remove and the sugar level was to my taste. As the recipe directed, I only beat the eggs until very soft peaks formed, and I took it out as soon as there wasn’t liquid batter on the toothpick, and it was incredibly moist and quite light for a flourless cake, although very rich. I thought I could have easily at least doubled the amount of cherries on top, and will do that next time. Wonderful recipe. Thank you for introducing me to Julia Turshen, have just bought Small Victories and cooked from it all weekend! I made this for a babyshower this weekend, and it was great! I really have no suggestions- I didn’t use the cherry preserves, just whipped cream. I wonder if maybe it would be too sweet with a jam/jelly situation, but with just a slightly sweetened whipped cream it was great. Trader Joe’s sells jarred Marello cherries that are my absolute go to for black forest cake. Inusually make my own cake, but this year was crazy, so my birthday dessert this year was an absolutely scrumptious chocolate sorbet topped with whipped cream, these cherries, and toasted almonds. I promise I didn’t complain that I didn’t have time to bake. I can hardly wait to make this. Yum! I was just having a craving for good Black Forest Cake. I miss it from Freiburg when we lived in Germany. This black forest cake looks so delicious. Looks like the perfect dessert for the holidays. This was an absolutely beautiful recipe! I want to try and make this a Keto friendly recipe which might be tough, but I will link back to you if I do make it successful! This might be the dessert that convinces me to love cherries…but I’d love to try making it with a fruit that I *already* like! I saw that someone in the comments used preserves with crushed raspberries instead, which sounds lovely– any other berries/fruits you’d recommend to try for us cherry-averse, not-so-creative bakers? Will definitely be trying the sunken Black Forest cake. It looks elegant, delicious and simple to make, exactly what I need to impress my family. This cake looks delicious, and that’s awesome that it is flourless. I wonder if this can be adapted for Keto or THM by substituting the sugar with gentle sweet or Stevia type sweetner. Either way, can’t wait to try it. Oh wow! This looks absolutely delicious. You think it is possible to make it with strawberries instead of cherries? Wow! This is a nice one. This looks absolutely amazing! I think I’ll be trying this at the weekend for sure! I love that it’s gluten-free as well, perfect for my mum! This sounds delicious, looks awesome and seems refreshingly easy to make! Can’t wait to try this recipe! This recipe is what I need right now. I was looking for a new and delicious cake to bake for Christmas and I think I found it! Happy to have stumbled on this website. My husband has recently had to change to a gluten free diet so this recipe will really come in handy when he wants a sweet treat! It looks delicious! Your cake looks absolutely amazing! Our family has always loved Black Forest Cake. We have made it at home and ordered for dessert at good restaurants. The combination of dark cherries, chocolate and whip cream is the reason why this recipe is so delicious!! Printing now too. Do you by any chance have a recipe on how to make the cherry preserves from fresh cherries? This looks amazing! I used this recipe, and they turned out great! My son loves black forest cake, even requested one for his birthday. For Christmas, I need some sugar-free desserts. Do you think this would work with a sugar substitute like Swerve or Lankato Monkfruit? Thank you. What if I hate cherries (because I do. YUCK.)? Could you do something similar with blackberries or strawberries? Holy man, this looks good! Looks delicious! My habit with freshly baked chocolate desserts is to eat them when hot. Is there a reason I shouldn’t with this cake in particular? Should I control myself (so hard!) and truly wait for it to cool? Edit note: “firm/dry to the dough” I’m assuming you meant to the touch? Lol, yes, to the touch. Will fix. Re, hot — you could, and put the whipped cream and cherries over a single slice (because you’ll eat it very soon) but if you put whipped cream over a whole warm cake, it will melt in as it cools. Oh my, this looks wonderful! I have friends over for dinner tomorrow – think I just found my dessert… love the fact it’s easy-ish to make too. Beginner’s question – can I substitute regular salt for kosher salt? PS your opening line made me laugh out loud – I can totally relate to my kids being 25% candy! Thank you. Yes, if substituting regular/table salt, use half. This was amazing! I’ve typically messed up both the beating and folding in of egg whites but the directions were very clear and easy to follow. I made this for my father-in-law’s birthday and he loves raspberries, so I swapped the cherries for fresh raspberries that were somehow both delicious and reasonably priced in November. 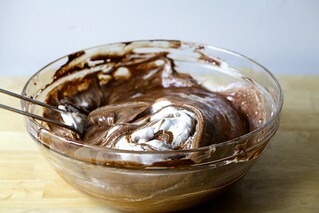 Making this for a birthday and the batter is lumpy. After asking google it appears I didn’t mix the batter well enough before folding in the egg whites? I’m going to cross my fingers and hope it turns out. Any advice for next time? Made this twice tonight because stubborn. The egg yolk-chocolate-butter mixture was very thick, almost like a paste, and didn’t fold well with the whites resulting in a chunky batter. The second attempt baked up okay, but didn’t puff as much as the photo above. The interior of the cake is speckled from the chocolate “chunks” that didn’t mix in with the whites. What did I do wrong..? Over mix? Under mix? Would love some guidance. Thanks! The same thing happened to me – I’m wondering if the yolks were still too cold, causing the melted butter/chocolate mixture to seize? This is what I thought as well, but in my second try I used room temp eggs and had the same result. The cake was a little more brownie-like, but still loved by everyone who ate it. I had a similar experience. I ended up folding the egg white a bit more than I like. It worked though and although the batter was chunky, I do not think the flavor suffered in the end. Same – still a delicious result! This is a mouthwatering recipe. Can I put it on microwave in convection mode if i do not have oven? This was absolutely outrageous. And I used inferior ingredients because I didnt have time to go to the store and I had to throw this together for my BFF’s birthday lunch. We both had seconds and I’m pretty sure it good manners prevented third. This looks absolutely delicious! My son loves Black Forest Cake, and I think this will become a new household favourite. Thanks for the inspiration. My MIL is requesting a chocolate cake for Thanksgiving, so I was thinking about making this, but instead of filling it with sour cherries, I made a cranberry sauce (similar to the filling for the cranberry pie, which reminds me of sour cherry pie: https://smittenkitchen.com/2014/11/cranberry-pie-with-thick-pecan-crumble/)? Alternatively I was thinking heavenly chocolate cake roll, because it bills itself as light, which I think is needed post turkey dinner. I just made this cake for my friend’s birthday. It was AMAZING!! I love all your recipes, but this one is the best I’ve seen. I modified it a little bit by using luxardo maraschino cherries and syrup to make “cherry preserves” for the topping. SO GOOD!! Keep ’em coming! Hello! Thanks for the beautiful recipe. I am an inexperienced baker. I’ve been baking this forever, way past the time noted and I can’t get a toothpick inserted in the center to come out “with just a few dry crumbs”. Is it okay for the center to be moist? It’s very gooey. Oven temp looks correct. What did I do wrong? Yes, take it out. A little softness is fine/normal. Thank you! It was amazingly good! Oh wow, that looks so delicious! Need to try this ASAP! I made this for Thanksgiving and it was delish!! Something odd happened with my cake batter – so super thick that it was basically impossible to fold in the egg whites. They were just mixed in, and the batter looked odd/chunky when I put it in the oven. Still don’t know what the problem was, but no matter – it was a yummy, dense, rich but not too sweet chocolate cake! 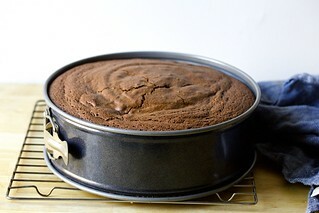 I’d had my eye on this and finally made it for my birthday yesterday – I agree with other commenters who suggest using the springform pan, as mine was so delicate-looking after baking that I was too scared to try and invert it. I made some quick sour cherry jam (I’m a bit of a freak when sour cherries make their annual thirty-second appearance in the grocery store and buy enough to pit and freeze for the rest of the year) and served it alongside the cake with whipped cream, and it was perfect. Souffle-like in its texture, with fudgy chocolate flavor – and it was eagerly consumed by four out of four children to whom I served it! 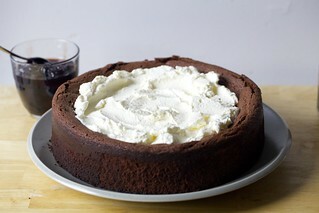 Planning on making this and Richard Sax’s Chocolate Cloud Cake on Food 52 over the next few weeks. That recipe has 4oz butter, 8oz chocolate, and 1 cup sugar, but otherwise same eggs and method. What would the essential difference between them be? I haven’t made it yet so I cannot compare, sorry. This is gorgeous! I am planning to make this Friday evening to serve Saturday – if I stick it in the fridge, would I be better off adding the whipped cream and cherries before serving, or will the whipped cream hold up OK on the cake in the fridge? The whipped cream will hold up but the cherries will not hold up (in appearance, it won’t look great) so add them before serving. This was fabulous. Oddly it took about 15-20 minutes longer to bake than described, but came out great (sea level, temperature in oven verified by a 2nd thermometer). Seemed like a great dessert for Christmas eve…definitely a hit and really attractive for how little work goes into it. Hey there! I made this for dessert for our family’s Christmas dinner and it was a hit! Everyone loved it. Very yummy. Thank you for the recipe. I made this this year for the first time for a family Christmas eve dinner. It turned out to be quite the showpiece and delicious far beyond my expectations. Everyone raved about it. It’s one of those desserts one keeps going back to the kitchen and sneaking little slices out of. Will definitely be making this again. Thank you! 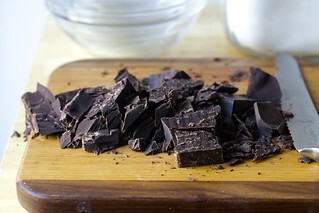 Will this recipe work with dark chocolate instead of semi-seeet (or bittersweet)? Yes and there is no difference in labeling requirements so any of those could be the same. I found this to have less depth of chocolate flavour then I expected. Guests adored the cherries and whipped cream on top and liked the cake texture being more sponge like than brownie. Wow this is a really yummy rich cake and simple to make. I don’t know why I was surprised by the richness after witnessing all that chocolate being melted, almost like a baked ganache. Maybe it was the term flourless. I made my own quick cherry conserve using a little honey, as its cherry season here and it was just beautiful. Question: I am planning ahead for Passover. All of your and Julia’s recipes that I’ve made are amazing, and I will probably make this cake many times before then. I was wondering though, for a dairy-free meal, what do you suggest for the whipped cream topping? 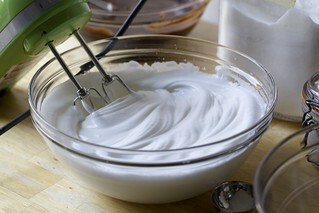 I often whip coconut cream as a dairy free substitute for whip cream. It doesn’t go quite as light and fluffy but it’s still delicious, and it has just a very light coconut flavour. Buy cans of coconut milk with the highest fat content you can find and that do not have any additives (they prevent the liquid from separating into coconut cream and coconut water). Refrigerate them overnight (or longer). Then whip as you would cream. Thanks, I haven’t ever used coconut as a whipped cream substitute. I’ll have to try it! This was delicious, but you can’t use a standard 9×1.5″ round cake pan. Mine *almost* overflowed but didn’t–the batter puffed up along the sides and then when I tried to remove it after it cooled, the edges that had puffed over fell off. Looks ugly now, but tastes great. Deb, maybe edit the recipe to say you need to use a tall 9″ round cake pan or springform? I always thought standard cake layer pans had 2″ sides, which is why I didn’t mention it. I’m sorry it caused trouble. Glad it still tasted great.